The Collected Works of Ambrose Bierce (1911), Vol. 7, The Devil's Dictionary, 84. Is not Fire a Body heated so hot as to emit Light copiously? 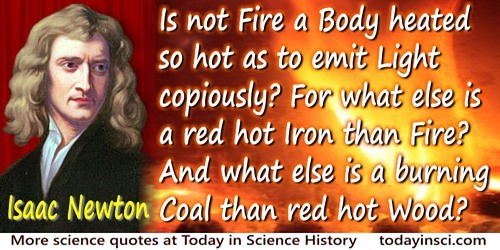 For what else is a red hot Iron than Fire? And what else is a burning Coal than red hot Wood? Opticks (1704), Book 3, Query 9, 134.